Marvel cosplayers at the Marvel Cake Boss event. Photo by Ron Gejon. 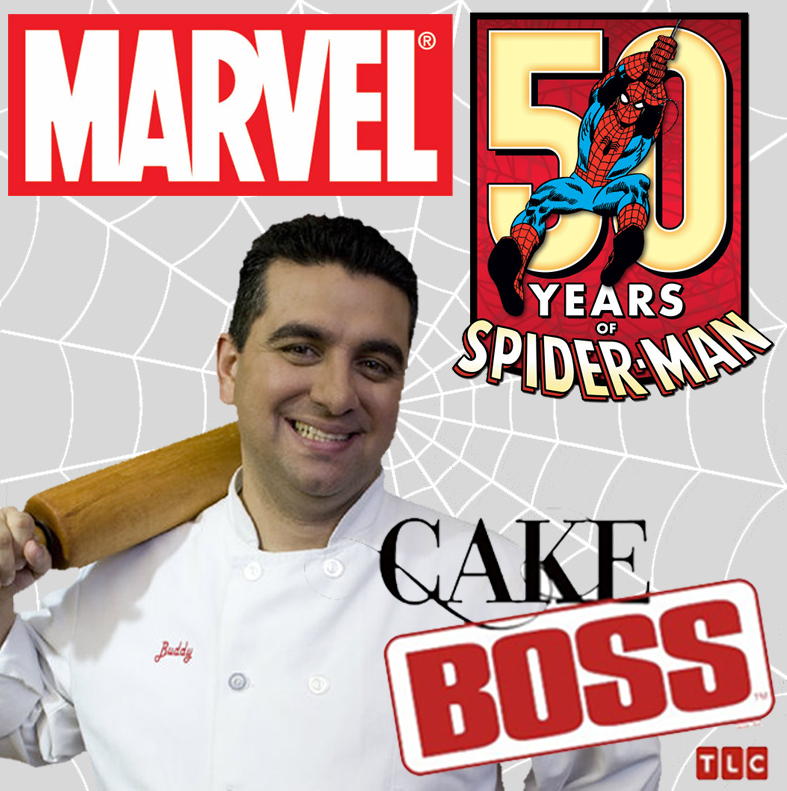 In this special episode, Buddy, the Cake Boss himself, is summoned to Marvel Entertainment’s headquarters and takes on the ultimate super heroic challenge- create a cake worthy of Spider-Man 50th Anniversary for a special rooftop celebration brought to you by Marvel and Midtown Comics! It’s a battle of super heroes and super villains as the team struggles to complete one of their most complicated cakes ever—but just what does that mean for everyone’s favorite Friendly Neighborhood Super Hero? Hey Marvel Fans! Cake Boss Wants to Put You On TV! The hit show Cake Boss is filming a very special episode for Spider-Man’s 50th anniversary this Saturday night in New York City and you’re invited! Join Marvel creators and staff as they party it up on a NYC rooftop Spidey style! You’ll be part of an extremely limited and special event PLUS you’ll be on the TV show Cake Boss. This will be the season finale episode for Cake Boss, so Buddy has gone all out for this Marvelous Spider-Man cake! And the best part? You get to eat the cake!!! We want to see your best Marvel costumes! We want this event to be as MARVELous as possible and your cosplaying expertise will do just that! This event will be limited to a very small guest list of COSTUMED Marvel fans. To be put on the list, email your name, age, and a photo of your Marvel costume to media@midtowncomics.com be sure to have CAKE BOSS EVENT in the subject line! You will be informed of the location and time once you are confirmed. All guest must attend in a Marvel costume. This list will fill up extremely fast so don’t wait!